E-Governance is the process of delivering public services to the citizens through the Information and Communication Technology with reliability, transparency and efficiency, without breaking the concept of cost-effectiveness. E-governance saves money, fuel and time of citizens by avoiding the visits of the government offices and on the other hand it saves money of government which is used for office maintenance. Though the concept of e-Governance was started in eighth decade of the 20th century, it entered the second phase (organized / wireless + satellite) in India with NeGP-1.0 in 2006. This article explores the growth and development of e-Governance in INDIA. The authors also present the analysis of the implemented e-Governance projects based on comparison with other regions of the world. Moreover, this paper also identifies the obstacles that need to be overcome to provide seamless access to the government services to the citizens. Since 2007, the Govt. Of India, provides Right to Information (RTI) (Government of India, 2016) to its citizens. In such a situation, e-Governance is the only way to provide efficient and secure government services. Indian government started e-Governance in early decade of 2000 (D. Evans, 2006). We have achieved various milestones during this journey. Every segment of the government is taking part in the process of implementing e-governance. At the same time, some legal, constitutional and behavioral reasons are playing the retarding forces towards implementation of e- governance. Government can provide their services through ICT with single online transaction with 24 X 7-service availability instead of service availability only during office time, i.e. 9 - 5 on weekdays. The government can allow citizens to access these services anytime (24 hours in a day on all the 7 days, in a week) and these services can be accessed from any place with ICT facility, instead of reaching the particular office premises. Benefits to Government: Government can save money by avoiding expenditure towards the cost of stationary, printers, etc. Government can also save time of their staff by avoiding interaction of various citizens (Saxena, 2005). India has taken many steps towards e-governance implementation. The journey of Indian e-Governance development started with the establishment of the National Information Center (NIC) in 70’s. In 80’s, the government started in-house projects for various departments. Further to define standards for e- Governance pro jects, various frameworks and guidelines for e-Governance has been defined. The ultimate objective of government about e-governance is to migrate the governance processes from manual to ICT based e-Governance processes. (Darpan Anand V. K., Study of e-Governance in INDIA: A Survey, 2017) This paper presents overall journey of Indian government towards establishment of e- governance system and compares it growth with the United Nation’s study of e-Governance for their members since 2000 (Government of India, 2015). Motivation: The motivation of this article is to check the direction and path of the e- Governance development. Along with this, the status of the e-governance should measure within a standard global framework. 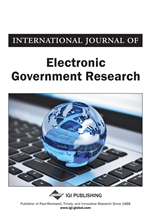 To index the e-governance growth, this paper uses the United Nation’s e-governance measurement framework and further this indexing strengthen by some more parameters, which identified and included in this paper. Various e-Governance parameters of INDIA is compare with parameters of the other areas and regions of the whole world.